If you had been to South Korea, you certainly had eaten kimchi because kimchi is provided as side dish for most of the Korean food. Kimchi is one of the traditional Korean foods. It is made by a process of fermentation. 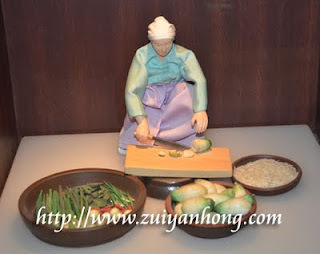 The materials of making kimchi are garlic, ginger, radish, scallion, cabbage, salted fish, cucumber, watercress, dried chilli, salted shrimp, mustard leaf and pepper powder. Remove the damaged outer coating leaves of the cabbages. Split the cabbages into half by cutting the cabbages from the bottom with a knife. Soak the cabbages in brine for a fixed time. After that, rinse the cabbages in cold water. Prepare seasonings and ingredients and mix them well to make stuffing. Stuff the prepared materials between the layers of the cabbages. 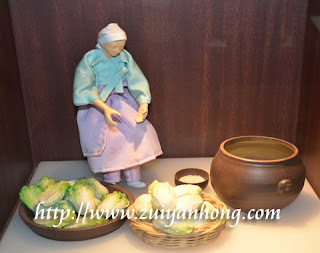 Wrap tightly the stuffed cabbages and place them neatly in an earthen jar.